and people stuck in the habit of churning out easy-win articles rather than investing a longer-term effort in something of depth. Until now I’ve addressed these problems largely through teaching and individual feedback. But for the next 3 months I’ll be trying a new way of organising students that hopes to address those two problems. As always, I thought I’d share it here to see what you think. Students are allocated one of 5 roles within a group, investigating a particular public interest question. They investigate that for 6 weeks, at which point they are rotated to a different role and a new investigation (I’m weighing up whether to have some sort of job interview at that point). The group format allows – I hope – for something interesting to happen: students are not under pressure to deliver ‘stories’, but instead blog about their investigation, as explained below. They are still learning newsgathering techniques, and production techniques, but the team structure makes these explicitly different to those that they would learn elsewhere. The hope is that it will be much more difficult for them to just transfer print-style stories online, or to reach for he-said/she-said sources to fill the space between ads. With only one story to focus on, students should be forced to engage more, to do deeper and deeper into an issue, and to be more creative in how they communicate what they find out. It is the editor’s role to identify what exactly the story is that the team is pursuing, and plan how the resources of the team should be best employed in pursuing that. It will help if they form the story as a hypothesis to be tested by the team gathering evidence – following Mark Lee Hunter’s story based inquiry method (PDF). This post on Poynter is a good introduction to the personal skills needed for the role. The community manager’s focus is on the communities affected by the story being pursued. They should be engaging regularly with those communities – contributing to forums, having conversations with members on Twitter; following updates on Facebook; attending real world events; commenting on blogs or photo/video sharing sites, and so on. They are the two-way channel between that community and the news team: feeding leads from the community to the editor, and taking a lead from the editor in finding contacts from the community (experts, case studies, witnesses). 6 steps to get started in community management can be found in this follow-up post. While the community manager is focused on people, the data journalist is focused on documentation: datasets, reports, documents, regulations, and anything that frames the story being pursued. It is their role to find that documentation – and to make sense of it. This is a key role because stories often come from signs being ignored (data) or regulations being ignored (documents). Here’s a step by step on how to get started as a data journalist. The multimedia journalist is focused on the sights, sounds and people that bring a story to life. In an investigation, these will typically be the ‘victims’ and the ‘targets’. They will film interviews with case studies; organise podcasts where various parties play the story out; collect galleries of images to illustrate the reality behind the words. They will work closely with the CM as their roles can overlap, especially when accessing sources. The difference is that the CM is concerned with a larger quantity of interactions and information; the MM is concerned with quality: much fewer interactions and richer detail. Here’s a guide to getting started in the Multimedia Reporter role. (This was called Network Aggregator in an earlier version of this post) The CJ is the person who keeps the site ticking over while the rest of the team is working on the bigger story. They publish regular links to related stories around the country. They are also the person who provides the wider context of that story: what else is happening in that field or around that issue; are similar issues arising in other places around the country. Typical content includes backgrounders, explainers, and updates from around the world. This is the least demanding of the roles, so they should also be available to support other members of the team when required, following up minor leads on related stories. They should not be ‘just linking’, but getting original stories too, particularly by ‘joining the dots’ on information coming in. There’s a post on 7 ways to follow a field as a network aggregator (or any other journalist) on Help Me Investigate. And here’s a post on ‘How to be a network journalist‘. Blogs like Created In Birmingham regularly round up the latest links to events and other reports in their field. See also The Guardian’s PDA Newsbucket. John Grayson’s post on G4S uses a topical issue as the angle into a detailed backgrounder on the company with copious links to charity reports, politicians’ statements, articles in the media, research projects, and more. This post by Diary of a Benefit Scrounger is the most creative and powerful example I’ve yet seen. It combines dozens of links to stories of treatment of benefit claimants and protestors, and to detail on various welfare schemes, to compile a first-person ‘story’. Datablogging – finding and publishing key datasets and documents and translating them/pulling out key points for a wider audience. The story so far – taking users on a journey of what facts have been discovered, and what remains to be done. What will make the difference is how disciplined the editor is in ensuring that their team keeps moving towards the ultimate aim, and that they can combine the different parts into a significant whole. If you’ve any suggestions or experiences on how this might work better, I’d very much welcome them. 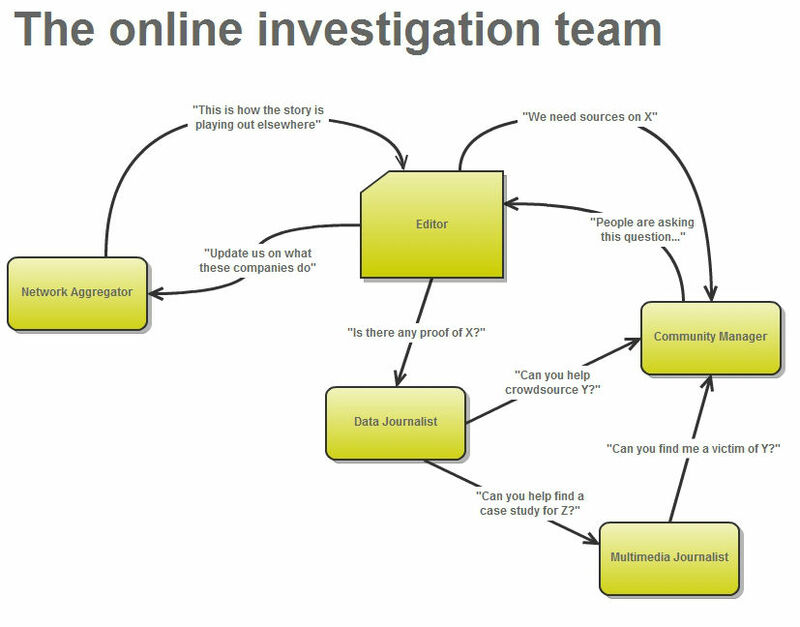 This entry was posted in blogging, data journalism and tagged birmingham city university, churnalism, investigative journalism, organisation, team roles on February 2, 2012 by Paul Bradshaw. 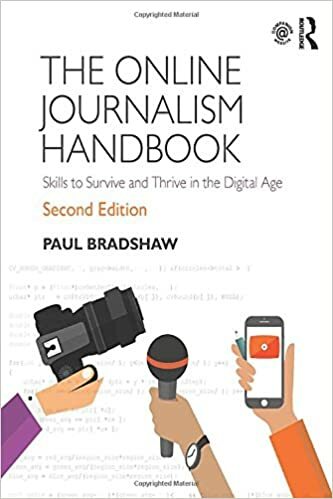 Paul, this promises to be a very fruitful approach that not only online news production courses, but also newsrooms could benefit. Thanks for sharing! My experience with online news production in the classroom shows me that it is important to give students time to mature a news topic, and that pitching a written rationale, followed up with a class discussion about the proposals is a good starting point. So far, I let students organize themselves within each team, and they tend to divide the job by taking each a different angle of the topic and producing a specific piece that fits in a set of connected pieces. 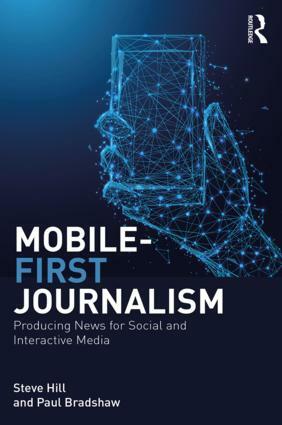 They are aware of the benefits of social networks and data journalism in the process of producing their story, but they tend to under-utilize them. That is why I think your strategy is very promising, because assigning very clear tasks to each of the students, they will likely make the most of their role and produce a more coherent (and deep) final product. Looking forward to hear how it works! Paul this is an interesting piece. Its more like breaking the story into small pieces where the journalists focus and delve deep away from the main story only to bring everything back together again. I can imagine the huge task that the editor has of keeping the journalists back on focus on the main story. Why I say so is that in the process of investigating story [ A ], story [ B ]surfaces which steers the journalist off track to the point that story [ A ]becomes a protracted never ending story. What do you imagine the significant whole looks like? I imagine it could take many forms. Is it simply tied together in a topic page? Is it just an ongoing stream of posts and documents and interactives? How do you provide context?